In the city of Birmingham, poor air quality, and poor internal transport links, are symptoms of years of failure to maximise the potential of existing infrastructure. For example, present-day congestion on the Soho Road and Alcester Road was actually familiar to travellers in the 1970s. For longer journeys in the West Midlands conurbation (and within the city of Birmingham itself) rail has the potential to provide a time-competitive alternative to private cars. But the transport agencies involved have preferred ‘image’ projects, such as the Midland Metro tramway, and the High Speed 2 railway to London. An effective approach to tackling congestion in Moseley, Kings Heath, and Handsworth, would include implementing a Walsall – Birmingham Snow Hill – Redditch rail link, as part of a wider Birmingham Crossrail scheme. As well as a number of new stations, this would require new connecting curves at Benson Road (Soho), and Bordesley (Camp Hill). On its website, the Heart of England High Speed Rail Action Group (HHAG) displayed an unofficial pictorial impression of the HS2 viaduct in Berkswell, seemingly using a ‘scaled up’ Advanced Passenger Train to represent the outsize HS2 captive rolling stock. This did not find favour with David Begg’s Campaign for High Speed Rail, which claimed that it depicted a viaduct that was “hundreds of feet high”, exaggerating the visual intrusion. The image shown on the HHAG website isn’t correctly scaled in perspective, but it certainly doesn’t depict a viaduct “hundreds of feet high”. The official impression of the viaduct, produced by HS2 Ltd, features plenty of visual massaging of its own, with its use of white livery to camouflage the trains. In its impression, the train is not moving. No doubt, that’s because of the total absence of overhead line equipment. Obviously, the visual impact depends on the total height of the structure, including overhead line equipment. But HS2 Ltd don’t even seem to know how high the viaduct would be. In the Route Engineering Report, they claimed it will be 8 metres, but in maps, the claim is “no higher than 10.2 metres”. Another big issue with running high speed trains on viaducts is noise propagation. 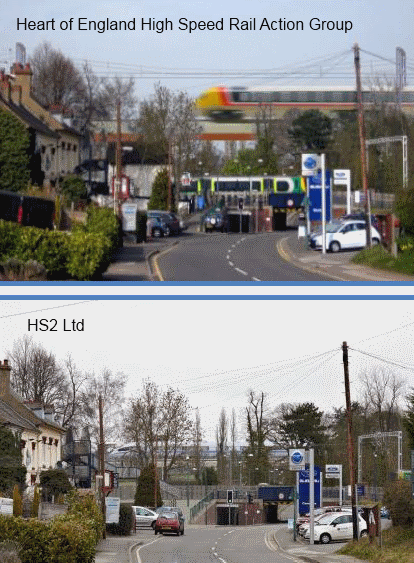 However, HS2 Ltd’s impression shows no noise barriers – for a line carrying up to 36 high speed trains per hour. Presumably, the visual impact of noise barriers is another part of the story that HS2 Ltd do not wish to tell. The issue is over the scale of disruption that will be caused by the proposed high-speed rail viaduct next to Berkswell station in the West Midlands (ref: 1). The Heart of England High Speed Rail Action Group (HHAG) has used photoshop technologies to depict a viaduct that appears to be hundreds of feet high, with a giant, outsized train clearly overwhelming the local landscape (ref 2). The official image released by HS2 Ltd demonstrates how the viaduct has been carefully designed to cause minimal disruption to the local area. Official estimates suggest that the viaduct will only be approximately 8 metres high (ref 3). (ref 1) The viaduct can be seen on the proposed route produced by HS2 Ltd here: http://highspeedrail.dft.gov.uk/sites/highspeedrail.dft.gov.uk/files/HS2-ARP-00-DR-RW-04224.pdf. (ref 2) The image has been distributed via their website: http://hhag.org.uk/no-ordinary-railway.php. (ref 3) HS2 Ltd’s Route Engineering Report claims it will be 8 metres high: http://highspeedrail.dft.gov.uk/sites/highspeedrail.dft.gov.uk/files/hs2-route-engineering.pdf, p.150. The maps produced by HS2 Ltd (see above) claim it will be no higher than 10.2 metres. On BBC television yesterday (2011-05-16) there was another Business Nightmares programme about marketing failures. I suppose the Hoover free flights debacle is now long enough ago, for some people (business undergraduates?) not to know about it. A bit like when the intro to “Just Like Starting Over” was played on University Challenge, and neither team had any idea what it was. Even though Business Nightmares wasn’t much more than an excuse to air some old tapes, it did – at least in the section about Sunny Delight – serve as a reminder of the limits of branding. After the British public woke up to the realities of the delightful drink, sales went into a freefall that no amount of rebranding could reverse. About the time Sunny Delight was growing its market share, more of Britain’s local authorities were becoming interested in marketing. In the 1980s, Glasgow’s Miles Better was one of the first attempts to rebrand a British city. But no matter how many times this null comparison was printed on public relations brochures, it made no difference to daily life. In 2005 Centro, the West Midlands Passenger Transport Executive, commenced rebranding of public transport using the ‘Network West Midlands’ moniker on vehicles, bus stops, stations, printed material, advertising, and internet. Unsurprisingly, the rebrand failed to have any effect on usage of bus, rail and tram services. The idea of fostering the belief that there was a public transport ‘network’ – rather than a number of customer-averse companies, in competition with each other – was bound to fail. Under council leader Mike Whitby, the phrase ‘Global City, Local Heart‘ has been added to Birmingham council’s website, amongst other things. The city wants to market itself as an international business city. But the buzzphrase had not stopped the implosion of the city’s private sector, which has seen Metro-Cammell, Serck, Denso (Lucas), Rover (Austin), and the Sherpa van factory (Leyland Daf) all passing into history, oblivious to sloganeering. Hype is no substitute for substance. Any attempt at (re-)branding a city is destined to fail, unless there is some underlying truth on which to build. In Birmingham, the back story is years of industrial decline, bad air quality, poor transport, overcrowding, antisocial behaviour, lamentable architecture, and dysfunctional transparency. So I don’t think Sion Simon‘s talking up the importance of branding offers a way forward. There has to be a semblance of progress on real issues, before calling in the yah men. Birmingham Chamber’s April 2011 Chamberlink has an article by Alan Marshall, the editor of Railnews, titled “HS2 – why the alternative does not stack up”. Opponents of HS2 often maintain there is a better alternative — uprating the existing railway infrastructure. They base their claims on ‘Rail Package 2’ (RP2), one of five incremental alternatives produced by transport consultants WS Atkins for the Department for Transport to compare against HS2. Well, uprating the existing railway infrastructure is certainly a better alternative. But Rail Package 2, or whatever it’s now called, is not “the” alternative. It is junk produced by W S Atkins, who have been pushing for HS2 style high speed rail for years. For example, in 2002, Julie Mills, now of high speed rail lobbyists Greengauge 21, “led the major Atkins study into the feasibility of a north-south high speed railway line“. Atkins’ “work” on Rail Packages 1 to 5, presented as alternatives to HS2, has been conducted with the aim of bolstering the case for Adonis/Steer high speed rail. So it’s no surprise that Rail Package 2 is a crock: that’s what the Department for Transport wanted Atkins to deliver. The DfT wanted “evidence” that HS2 should be built. Rail Package 2 is based around Birmingham to London intercity trains continuing to use the West Coast Main Line, and Birmingham New Street. But there is no sense in such an arrangement. The Birmingham to London intercity service should be transferred to the Chiltern Main Line, using Snow Hill and Paddington stations as the origin and destination points. This would rebalance WCML traffic north and south of Rugby, and facilitate a workable and incremental upgrade strategy that negates the need for HS2. Routeing trains through Snow Hill could also provide all Black Country boroughs with direct fast rail services to London. Using available funds to improve and extend services on the West Coast, East Coast, Chiltern, and Midland Main Lines maximises the use of existing resources, and improves resilience. 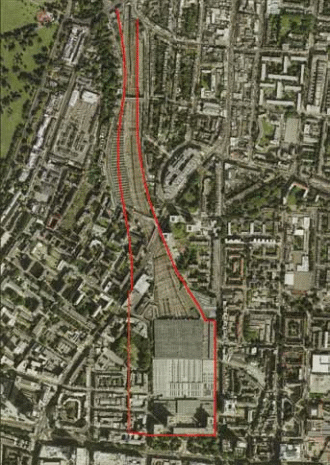 By contrast, the HS2 project seeks to channel all fast rail traffic for the Midlands and North of England along a solitary pair of tracks running into Euston station. those who claim that the UK is too small to support a high-speed rail network should look at the evidence – the best high-speed line runs from Frankfurt-Cologne, about the same distance from London-Birmingham. It’s worth checking out whether the NBS Köln–Rhein/Main is the success that Mr Begg claims it to be. Some background is given in the German OMEGA team’s New ICE Cologne–Rhine/Main line report and the article in the German Wikipedia. More than forty years ago, West Germany’s state railway, Deutsche Bundesbahn (DB), was drawing up plans for a new railway linking Cologne and Frankfurt. These cities were already connected by three railways, including two twin track electric lines following the banks of the Rhine that carried a high volume of domestic local and long distance passenger traffic (as well as hefty international passenger and freight traffic). But trains following the Rhine valley could not reach very high speeds. DB’s new line plans were eventually formalised as the 1973 Neubaustrecke Köln – Groß-Gerau, a route designed for mixed traffic (passenger and freight trains) having a maximum incline of 1.25 to 2 percent. Environmental and economic concerns stymied progress, and by the mid 1980s, even a magnetic levitation line was briefly under consideration as an alternative. The maglev option was discarded, but by the time construction got underway in 1995, the now-Deutsche Bahn Neubaustrecke Köln-Rhein/Main had a new name, a new 177-kilometre route, a different purpose, and a different specification (as a purely passenger railway). As with HS2 in Britain, the NBSKRM was shaped by politics rather than transport considerations. Major cities such as Bonn, Mainz, and Wiesbaden were by-passed by the NBS, but the much smaller towns of Montabaur and Limburg were able to get stations built on it. The major part of the line was opened in 2002, but this did not include additional uncompleted works on the Cologne approaches, intended to permit a headline journey time of 58 minutes from Frankfurt. The maximum incline of 4 percent made NBSKRM the steepest high speed line in the world. Only very high power trains could use it, so in practice ‘interoperability’ was restricted to ICE3 rolling stock. On the other hand, the minimum radius of 3320 metres and maximum speed of 300 km/h were specified so that it would be possible to follow an existing transport corridor, so as to “concentrate environmental impact”. Nevertheless, construction involved extensive tunnels and viaducts, and slab track, bringing costs over 6 billion euro (circa £4 to £5.5 billion, depending on the exchange rate used) and the resulting disruption and inconvenience affected other transport links, such as the A3 autobahn. Even with the lower 300 km/h line speed and the existing approaches in Cologne, NBSKRM provided a ‘headline’ cut in journey time from 135 to 70 minutes (a much larger journey time saving than the 82-minute to 49-minute HS2 saving between London and the West Midlands). With respect to door to door time savings, the situation is mixed. Compared with the planned HS2, the NBS has lower frequencies (meaning a longer embedded wait component), but the quality of its end connections, at least in Frankfurt and Cologne, could be viewed as being much better than the British equivalent. The intermediate small town stations on the NBSKRM make no sense in economic terms, illustrating that, as in Britain, high speed rail in Germany is largely driven by political considerations. With HS1, the political momentum was for providing (nonsensical) domestic stops (e.g., Ebbsfleet) as justification for using public funds to build it. With HS2, a different political impetus is at work, focused on (nonsensical) headline speed. So no HS1-style intermediate stations, and no NBS-style following of existing transport corridors (e.g. the M40, or the Great Central route through Woodford and Rugby). Germany did not have a Beeching style mass closure of railways, so the very inefficient utilisation of the NBSKRM does not manifest itself in capacity shortages. There are three other lines in place between Frankfurt and Cologne. serves existing rail termini in urban areas (Frankfurt Hauptbahnhof and Cologne Hauptbahnhof), no large scale urban reconstruction needed. Most of the discussion of the landscape and community effects of HS2 has focused on rural areas, such as the Chilterns, and to a lesser extent, south Staffordshire. But there would also be substantial urban impacts, especially in the approaches to Birmingham, and in Greater London. HS2 Ltd and the high speed rail ‘spinnerati’ have spread the message that HS2 – new build high speed rail – ‘avoids the need for costly and disruptive upgrades to existing lines’. However, the HS2 project would inevitably involve large scale disruption of existing railways, including the West Coast Main Line, the Great Western Main Line, the North London Line, and Euston station. To accommodate the longer and taller high speed trains, HS2 Ltd intends to rebuild Euston, with the station extending outside its current limits. The ‘remodelling’ would entail extensive demolition of streets and properties, and wholescale reconstruction of Euston Underground station. Because of the lack of detail in HS2 documents, it’s not clear how much the building of Euston Underground would cost, how long it would take, or how its costs are treated in the HS2 budget. The western platforms in the rebuilt Euston would be for use by HS2 trains, but during its ‘phased’ commissioning, they would be used by existing services using the West Coast Main Line. This means there would be lengthy disruption of these trains into and out of Euston during the reconstruction. According to the Department for Transport, reconstruction works “would be organised to maximise the use of rail to supply new materials and remove spoil and waste”. In reality, the rebuild would require most construction materials and waste to be handled by heavy goods vehicles. Not surprisingly, the amount of lorry movements hasn’t been mentioned. The architecture of the 1968 Euston station has been heavily criticised, but compared with HS2 Ltd’s scheme, that design looks like a triumph of elegance and style. Air rights seem to be the determining factor for the rebuild, rather than aesthetics, convenience, or usability. The Department for Transport’s intention is for Euston to become the principal London terminal for the East Midlands, Yorkshire, North East England, and Scotland. At present (apart from Glasgow) the London termini for these destinations are St Pancras and Kings Cross. Dispersing central London traffic arriving from Scotland, Northern England, and the Midlands, from one Underground station. “Our long term vision is for Euston Station to provide the principal rail gateway to the north-west and north-east of England and Scotland. We would rebuild Euston station to provide 10 high speed train platforms, 12 standard train platforms and 2 further platforms which could be used for either type of train. To do this we would need to widen the current station to the west as far as Cobourg Street and lengthen the station site to the south to allow for the longer high speed trains. Access to the new station would be from the south front (directly from Euston Square Gardens) and from both east and west sides. The new platforms would be located below ground and then covered over. A new Underground ticket hall, four times larger than the current one, would be provided to cater for the increased passenger numbers. 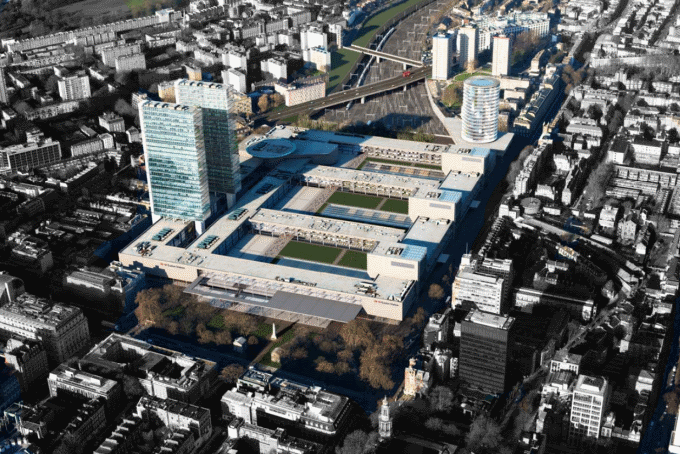 Direct access to Euston Square station would be provided for the first time. Construction of the entire station would take seven to eight years, with a likely start date of 2017. However, this would be undertaken in stages so that works on each section of the station site should not last longer than three years. The western side of the new station would be built first and then brought into service. We envisage this would allow the existing train services to continue throughout construction. The works would be organised to maximise the use of rail to supply new materials and remove spoil and waste. We would work with local residents, businesses and Camden Council to devise construction methods that minimise the impact during the works.